According to the Kansas City Star’s Bob Sutton, former SK standout and Seattle Mariner Willie Bloomquist and Mike Aviles are being linked to the Boston Red Sox. You can read more here. Dave Villwock, a Port Orchard native, won’t be taking the U-96 Spirit of Qatar boat to Evansville, Ind., this season. Here’s a link to get you up-to-speed on the season. It looks like the Thunder on the Ohio race, which has been run the past 40 years, won’t happen due to economic reasons. 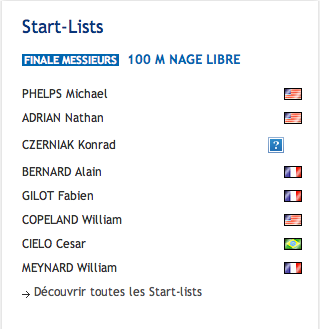 Bremerton native and California senior-to-be Nathan Adrian will compete today and Sunday at the Paris Open meet. Adrian, who is coming off a sweep of the 50 and 100 freestyle events at the Santa Clara Invitational last week, will swim in three events this weekend against some of the fastest sprinters in the world. Adrian is the top seed in the 50 in 21.46 seconds — ahead of 2008 Olympic champion Cesar Cielo of Brazil, Fred Bousquet and Alain Bernard of France, and Roland Schoeman of South Africa. Adrian is seeded second in the 100 (48.00) behind Michael Phelps (47.51). Also competing are Cielo, Bernard and California teammate William Copeland. Adrian is also swimming in the 50 butterfly. He is seeded 28th (25.50). South Kitsap’s Drew Polley is running in the Rock ‘n’ Roll half marathon on Saturday. Polley, 24, was fourth in last year’s half-marathon. It was one of the first of the longer races the former Washington State runner ran. Polley, who trains with the elite Hasons-Brooks Distance Project, was 16th overall at the Boston Marathon in April and has qualified for the 2012 Olympic marathon trials. He’s among the favorites to win the half marathon. After a week off to (mostly) beat up on non-league competition, the Kitsap BlueJackets return to West Coast League play on Friday at the Fairgrounds. The Jackets play the expansion Walla Walla Sweets tonight at 6:30 p.m. The Jackets went unbeaten against the the four teams from the Puget Sound Collegiate League it faced. The only loss during the five-game stretch came from the Seattle Studs. The Jackets return to league play battling the Bend Elks for first place in the West Division. Bend and Kitsap are tied with four losses each in the loss column. Bend is 10-4; Kitsap is 7-4. This is Kitsap’s best start in club history. The reason? Offense, baby. The Jackets were woeful with the bat last year and were second-to-last in just about every offensive category. This year they are third in the league in batting average and second in on-base percentage. The pitching hasn’t bad either, as it’s fourth in the league in ERA. Also tonight, the Kitsap Sun is honoring it’s athlete and coaches of the year before the game. For a reminder, Central Kitsap track and field and cross country coach Mark Ward, CK’s distance star Shane Moskowtiz and Kingston’s distance star Ruby Roberts will all be honored. South Kitsap’s Jason Hammel saw his scoreless inning streak end at just over 28 innings. Hammel gave up four runs in four innings. Also, here’s a story out of New England. Hammel married a woman from Providence, which means he had some fans in attendance when he pitched at Fenway. You can read about that here. Kickoff here at Bremerton Memorial will be in just about an hour as the Pumas take on the Portland Timbers in the second round of the U.S. Open Cup. Chatted with Kitsap executive director Ben Pecora a little while ago. Turns out there’s money on the line tonight. The PDL team that goes the farthest in the Open Cup earns $10,000. Kitsap and Long Island are the only two PDL teams that made it to the second round. If one team wins and one team loses tonight, the winner gets the dough. If both teams happen to lose, Pecora said Kitsap will ask the United Soccer Leagues for half — $5,000. As far as I can see, Derby Carrillo, Todd Wallenius, Kellen Wantulok and Zack Sampson are inactive for tonight’s game. The South Kitsap pitcher is en fuego for the Colorado Rockies. Check it out. Kitsap Pumas starting goalkeeper Dustyn Brim has missed the team’s last two games due to a back injury. When he returns to the lineup is still up in the air. Brim is dealing with a herniated disk in his lower back, an injury which will likely force him to have surgery after the season. Having played with a bad back for several years, Brim said he first began experiencing severe pain during the team’s season opener in Spokane. “It took me 20 minutes to put a sock on,” Brim said. He had an MRI test three weeks ago when doctors discovered the herniated disk. He was originally scheduled to start against Bay Area in the team’s U.S. Open Cup game Tuesday against Bay Area after missing Kitsap’s 2-1 win against Abbotsford, but Pumas coach Peter Fewing decided to start No. 2 goalkeeper Garrett Staples instead. Brim still believes he can play as long as he can handle the discomfort. But if the injury limits his mobility and ability to dive for shots, Kitsap will likely have to rely on Staples and No. 3 goalkeeper Derby Carrillo for the remainder of the season. “That’s kind of the boat I’m in now,” Brim said.